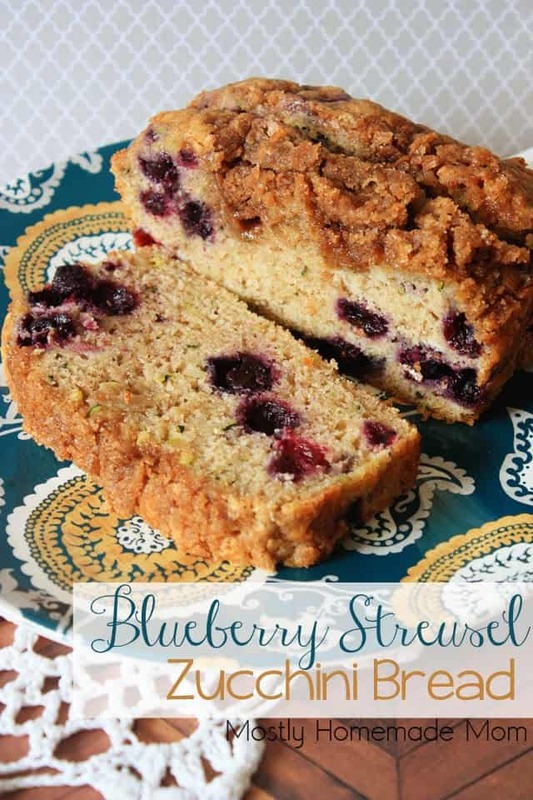 Use up that zucchini from your garden with this delicious blueberry version topped with a cinnamon and brown sugar streusel! This was actually my first time making zucchini bread, if you can believe it. 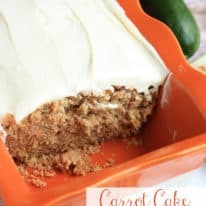 Why didn’t anyone tell me how awesome zucchini bread was?! I seriously had no idea! I don’t have zucchini growing in my backyard, but somehow I wound up with four large green ones in my fridge that needed to get used up before they went bad. Actually, what really happened was I had two different recipe ideas to try and people kept eating my ingredients! 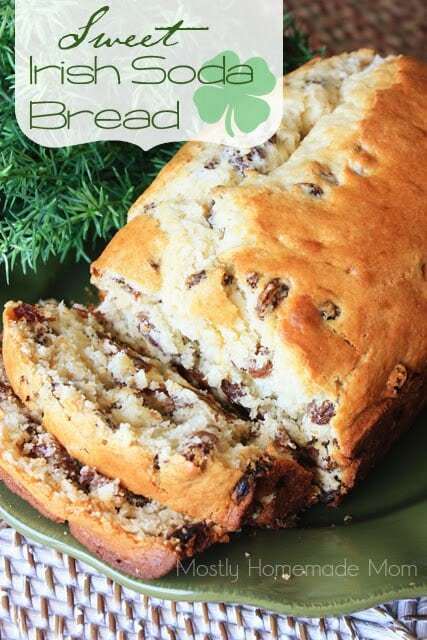 Honestly though, if you’ve never tried zucchini bread – the grated zucchini keeps the bread REALLY moist. 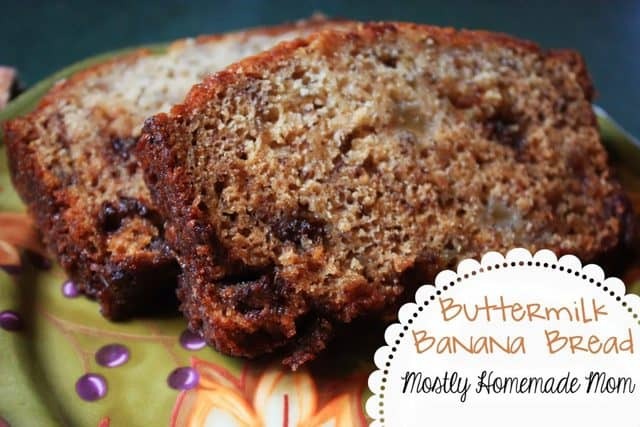 Like, banana-bread-moist. You don’t taste zucchini (which doesn’t have much flavor on its own anyway), it just takes on the other flavors in the bread. 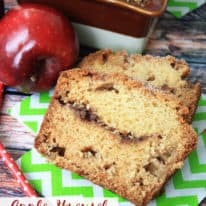 And the brown sugar streusel actually melted into the top of the bread and caramelized – I love that little crunch in the corners! 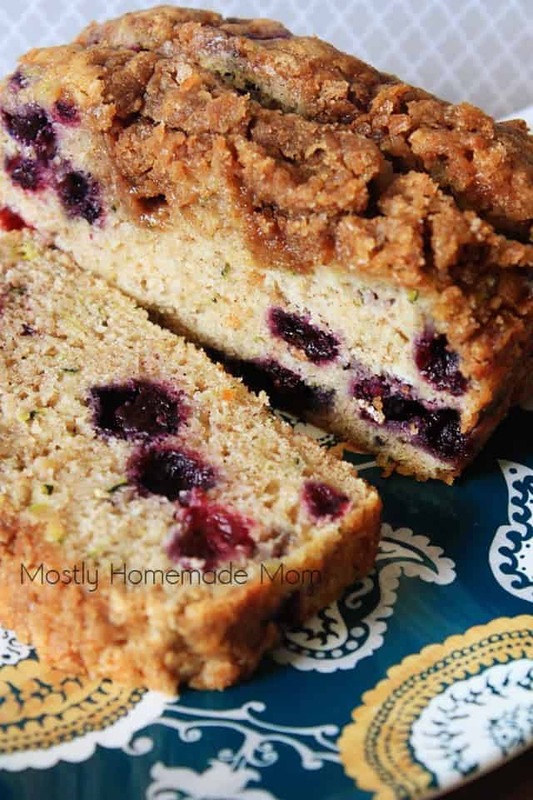 This would be perfect for company staying over or to take to a new mom since the recipe makes two loves. In a stand mixer, beat eggs, applesauce, oil, sugar, and vanilla extract until creamy. Meanwhile, dump grated zucchini into a dishtowel and wring out extra moisture. Add zucchini to stand mixer and stir until just combined. Add in flour, baking powder, baking soda, salt and cinnamon. Mix until well combined. Gently stir in blueberries. Spread batter evenly among two greased loaf pans. 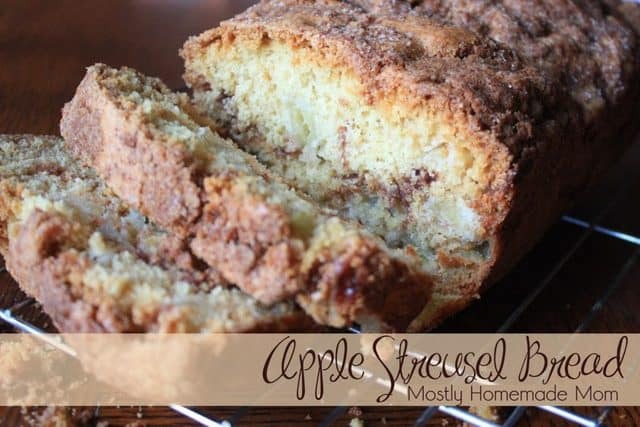 For streusel, add all ingredients to a bowl and cut with a pastry cutter (or two knives) until small crumbs form. Sprinkle evenly over top of both loaf pans. Bake at 350 for 50 minutes or until a cake tester comes out clean. Cool before slicing and serving. Absolutely perfect with your morning coffee! Kelly, I don't think this bread can get any better.. I am loving all the flavors! 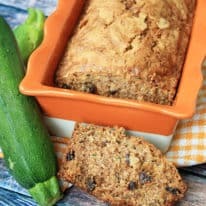 The only time I ever enjoy eating zucchini is in zucchini bread (which is why I refuse to grow it in my garden, that would be a LOT of zucchini bread! ), and this one looks above and beyond awesome! Pinned before I even made it down here to comment! Thanks so much for the pin, April! I hope you enjoy! Ahh I could too, Jenn! It went WAY too fast in this house!